Vitamin C equals healthy, youthful skin. In fact, beauty science reveals that applying topical Vitamin C can accomplish all of these objectives: more radiant and clearer skin, an increase in collagen production and a decrease in the depth of wrinkles. You can get your daily dose by including Vital C Anti Aging Serum as part of your skin care regimen. Being able to try this product in these sample sizes has several advantages. Their smaller size means that you can keep one at home and pop one in your purse, since this product offers great protection against UV damage. In addition, the size is ideal for inclusion in your travel kit. When friends notice your radiant skin, why not share one, so they can experience its benefits too? Since each sample contains a quarter ounce of serum, the sample sizes are also a great value. This anti-aging formula guarantees a pharmaceutical grade of Vitamin C serum. It's easy to use, too. Just apply it in the morning and/or evening to cleansed skin. Immediately, the complexion will benefit. 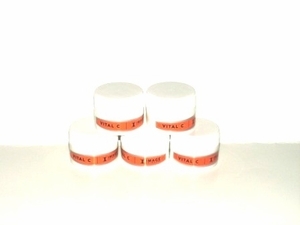 Topical Vitamin C can rejuvenate the skin in several ways. It is even more powerful when it is in ascorbic acid form like that of Vital C Anti Aging Serum samples. Vital C serum can bring life back to dull, tired faces. It is wonderful for all skin types and offers a smoother, brighter and firmer complexion. Vitamin C serum can also be layered for added anti-aging strength. The serum should be applied first, followed by a favorite moisturizer. The only beauty rule when using a Vitamin C serum is to not apply it at the same time a retinoid like Retin-A, Renova or retinol is used. The two clash and can cancel each other’s effectiveness. Instead, Vitamin C serum could be put on during the day, since it offers amazing protection against the sun's damaging UV rays. Then one could apply the Retin-A or Renova products at bedtime. Otherwise, Vital C Anti Aging Serum is an intelligent beauty choice as part of one's skin care arsenal. Dermatologists suggest applying a Vitamin C serum with at least a 10% Ascorbic Acid base. This Vital C product contains a whopping 15% ascorbic acid. It is also blended with resveratrol, a naturally occurring grape seed extract for smoothing skin texture and alpha lipoic acid to tighten up the complexion and create firm facial contours. Vital C doesn't feel at all greasy on the skin. In fact, it beautifully hydrates when necessary. It also suits oily complexions and helps to control acne breakouts. The powerful serum is also effective, gentle enough and calming for those with rosacea skin conditions. This Vitamin C serum will improve one's skin tone and offer superior protection from these factors; the potent rays of the sun, environmental aggressors and damaging pollution. It's never too late to develop a more beautiful, healthier complexion.